Our story began in 1974 with the launch of a range of dips and pita bread. From simple beginnings, the choice of products grew over the years to include a variety of cheeses, specialising in Haloumi and Feta. In August 2003, Mezé Foods was bought by Nick Papadopoulos, whose ambition helped to expand the range even further and turn Mezé Foods into a household name. Today, a myriad of products, including cheeses, dips, pesto’s and olives, are manufactured and distributed throughout the national retail and hospitality industries. November 2010 saw the dawn of an exciting new era when our state-of-the-art factory opened in Daleside. After completing his BComm degree at Wits University in 1993, Nick joined the Johnson & Johnson sales team, where he worked as a sales representative before being retrenched. He then became a partner at Strategic Sales & Marketing agency (SSMS), where, over time, he developed his area and was promoted to General Sales Manager, and then National Sales Manager of Strategic Retails Services, a specialised Spar division of SSMS. After a decade in the FMCG trade, Nick decided it was time to make the jump and invest in his own business and, in 2003, he bought Mezze Foods. It is through his focus and determination that the company has expanded into the successful business it is today. Athy Ferendinos (Nick’s mom in law) comes from a family whose roots are firmly embedded in “mom’s kitchen”. One of 5 sisters, the kitchen was a daily meeting place where a new recipe evolved or an existing one was given a facelift. 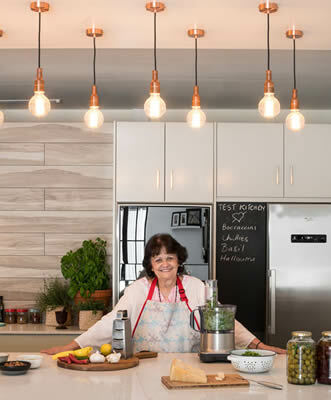 After being a partner in two very successful family restaurants in Durban, (The Greek Taverna & Eat Greek on Broadway) her passion for food and her children brought her to Meze in 2004. She has passed on all her knowledge, experience and passion over the years. She chases taste, and insists on the highest quality of ingredients and cooking workmanship. Athy’s enthusiasm for the perfect product has made her contribution to Meze invaluable. She is constantly on the lookout for new, tasty and timeless recipes assisting Meze to deliver exclusive and delicious goods to all customers. In 1999 under the guidance of George Betsakos, Jaco began his career at the Meze cheese factory in Duiker street. He started as a cleaner, washing buckets and after 6 weeks was training in the making of mozzarella and Haloumi. After 2 and half years he expanded the range to feta, ricotta, rabiola, pecorino and parmesan, and became Junior Supervisor. After a cheese making course with Adriaan Boer from Holland Jaco became Senior Supervisor. In February 2005 he teamed up with the Nick Papadopoulos to take on the exciting challenge at the new Meze Factory in Daleside. His enthusiasm, years of experience and dedication attests to his position today as a key contributor within the cheese factory.